Daigakuimo (大学芋) is a deep fried sweet-potato with Soy Sauce flavor. 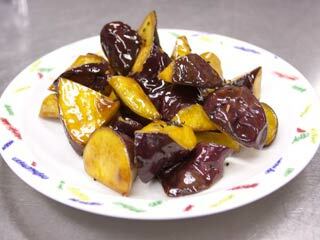 One of the popular dishes for Sweet Potato in Japan. This is good for also snacks, and Japanese kids love Daigakuimo. -Suger (5 large table spoons). -Mirin (1 large table spoon). -Soy Sauce (1 large table spoon). -Water (1 large table spoon). First lets cut sweet potato. Cut is one bit size. Then sink them into a running water for a while. Put oil into a deep pan and heat them (160 c). Take off water from sweet potato. Oil is ready, let's fry sweet potato. It take a while, so while waiting for the potato, let's make flavor. Put 1 large spoon of water in to a pan. Add sugar (5 large table spoons). Then boil it until it get sticky. When the color of Sweet potato change it to orange like this, then it's ready. The flavor is ready, too. Add fried sweet potato and mix them well. Add black sesame over, and That's it.